Will the real Paul Henderson please stand up? There’s a point in every federal election campaign when the question comes up: how much of a slapshot do we demand of our prime minister? We’re there now: this is it. If it feels all the more urgent this time, that’s because of the ominous news out of Moscow: Vladimir Putin has taken up hockey. He didn’t used to play. As recently as February, the Russian prime minister couldn’t skate, apparently, but then in his willful way he pledged he’d learn and two months later, boom, there he was, big and red-sweatered, a righthand shot. He scored a goal. A good game, he said, “less traumatic” than soccer. Sounds innocent enough, a happy photo op. But Putin is a politician, so everything he does has a purpose. He’s also Putin, the former KGB/FSB man: everything he does is more or less menacing. And, plus, this wasn’t just any ice Putin was skating on, it was Luzhniki Sports Palace ice, as in 1972, as in Henderson-and-Tretiak, as in we-were-always-going-to-win-and-so-that’s-what-we-did. This is like that, a sort-of incursion on our sovereignty — probably. Putin was obviously upping some kind of ante here — chances are. Maybe not, but what if? At the very least, it confirms the doubt that’s always been there in our own hearts, the one that ticks and ticks away, telling us that 1972 decided nothing at all and never will. Which brings us to the ballot-box question: which of our political leaders is best suited, hockey-wise, to face-off with the St. Petersburg Streak? The answer, of course, is Lester Pearson. The fact is, most of our 22 prime ministers never stickhandled a day in their life let alone scored a meaningful goal on the powerplay. That’s okay, we tell ourselves, no problem: we’re a tolerant people. R.B. Bennett sped down the wing? Not to worry: that’s what Howie Morenz was for. Pierre Trudeau preferred a canoe? Welcome to it: Jean Béliveau had him covered. For the rest, we’re content to extrapolate parliamentary personalities into hockey comparables, which is how we know that if Sir Wilfrid Laurier was a bit of an old-time Steve Yzerman, then Jean Chrétien was more of a mid-1980s Claude Lemieux. He probably could have done it, too. In 1921, as a student at Oxford, he starred for the Dark Blues on a European tour that included a rout of rivals Cambridge by 27-0 in just two periods — the third was called off for mercy. He went on to play for Switzerland in the European Championships, and England wanted him to suit up for the 1924 Olympics. Also, during the Second World War, he was applauded on the front page of The Times for throwing a cricket ball 104 metres — farther than any man on record. Of the current campaigners, they’ve all donned their Habs sweaters and said something or other about funding rinks in Quebec. None has appeared, so far, on skates, although Stephen Harper did get into a road hockey game in Ottawa where he scored, top shelf, on a nine-year-old. On the backhand, even. He surprised himself, it looked like. Probably our best bet, if it comes to a straight face-off with Putin? Governor-General David Johnston is a former Harvard captain — though, who knows, constitutionally that might be a problem. Putin having framed this whole thing in 1972 terms, maybe that’s the way to go. Who now, today, has the game-winning gumption to pounce on Phil Esposito’s rebound? Upon whom would Yvan Cournoyer throw himself in joy? Who’s our likeliest Paul Henderson here? Jack Layton has a certain Mickey Redmondness, though that may just be the moustache. Gilles Duceppe would seem like an obvious Vic Hadfield, him or any of the other disgruntled players who declared their independence and left the team high and dry in Moscow. Elizabeth May, I guess, is your Bobby Hull — a formidable force, maybe, but no matter how much he wanted to play, he just couldn’t get on the team. Michael Ignatieff played some hockey as a boy, and in his books he builds some compelling hockey lenses with which to look at the country. And if he finds himself cast in a largely denying role, as a lone figure, a little aloof, crouched and crease-bound, well, then I guess who else can he be but Ken Dryden — which is confusing, of course, since there’s already an actual Ken Dryden in the Liberal line-up. Stephen Harper may never have been much of a skater (as he told Dominic Moore, then of the Leafs, in 2009), but we’ve never had a prime minister with so much hockey on his mind. A student of the game, he’s often called, and it’s well-known that he’s been working on a history of the game in early Toronto since he took office. He shows up at Calgary Flames games, offers between-periods analysis on World Junior broadcasts. He probably didn’t need to be told, as he was in 2006 by ace American strategist Frank Luntz, that a good way to distract Canadian voters was to talk as much as possible about hockey: I think he’d already decided on that anyway. As a politician, Stephen Harper has proved shrewd and skilled, with a mean streak wide as the blue-line. He takes bad penalties. A predatory centreman maybe you’d call him, two hands on his stick, and an eye on Valery Kharlamov’s ankle and whatever it takes to win. They have a phrase in Russian for this that may still be afloat in the air of the high slot at the Luzhniki: Bobby Clarke. Though if we were so merciless on the ice, did it really matter how kind we were in print? Topple, overwhelm, stun: all the vanquisher verbs we take for granted now have their roots in those early hockey Olympics. A couple of useful rules of thumb: verbs associated with fairytale ogres marauding through tiny upland villages also work well for big hockey victories, e.g. conquer, smash, crush, squash, quash. The contractor renovating your basement is a pretty good guide, too: hammer, plaster, and shellac. For some reason culinary terms don’t really translate, which is too bad when you consider how the satisfaction involved in saying words like fricassee and spatchcock. 1. The Ship They Came In On. This one is pretty obvious. Does anyone really believe that the 1920 Falcons would have won Olympic gold without Canadian Pacific’s Melita to ship them to Belgium? Where would they have been without it? Saint John, New Brunswick is where. On the voyage out, nobody got seasick. The ship’s carpenter is supposed to have carved all the sticks that the Falcons wielded in Belgium, which is pretty great, if it’s true. I know what you’re thinking and yes, it’s true: the 1924 Granites had a Stuffy and several brothers Plaxton, but no Bobby. They still won. What about the Grads in ’28? Also Bobby-free. That’s the thing: our Bobbys aren’t always named Bobby. Ryan Smyth, for instance, is a pure Bobby, other than his name. Shane Doan. Here’s my best guess: other than ’72, we’ve been careful to husband our Bobbys. My own theory on this is that very quickly we realized the danger of overt Bobbys was (a) they’re easy to identify and neutralize and (b) assuming as we must that the words proprietary technology mean nothing to Finns and Latvians, what’s to keep them from filching our Bobbyness and applying it to all their young Miikas and Kimmos and Anttis? Temperatures waned below zero this week in Saskatchewan. Meanwhile, in darkest downtown Toronto, Darcy Tucker beat the Panthers of Florida with a sly backhand. It’s confirmed, then: hockey is here again. Nashville, if you hadn’t heard, is a threat to win it all. Plans to move New York’s Islanders to North Korea, in case you blinked, are temporarily on hold. Two other hockey things you may have missed. One is that NHL vice-president Colin Campbell has announced that intermissions will be two minutes longer. Commercial breaks, too, will be extended for televised games. But wait. Wasn’t it just last year they were trying to hurry the games up, streamline the product? What he’s talking about, of course, is books. Maybe he doesn’t know it, probably doesn’t, but he will. What else slows the game down, tells its stories? Enough with the TV, the internet, cellphones, and whatever new handheld hockey technology Jim Balsillie comes up with next week. So that’s confirmed, too: what hockey needs right now is more hockey books. Who came up with this winner? Something else that may have passed you by — a third hockey thing — was Campbell’s boss, NHL commissioner Gary Bettman, declaring that after all the tumult of the, um, labour stoppage, the time has come for everybody to focus on what’s really important. “We’ll shine the spotlight on the players more than ever,” he says. Books again. Except that in this case, rather the future, Bettman is focussed on the present: the fall’s output of new hockey books. The considerate commish wants it known that the trend this year is to books about individual players. Sidney Crosby. Martin Brodeur. Bobby Orr. Bill Gaston. In other words, titans of the game. Crosby’s no surprise, of course. As the latest in a long Canadian line of Next Ones, the 19-year-old pride of Cole Harbour, Nova Scotia, was the subject of three hockey biographies before he’d played a minute on NHL ice. With the publication of The Rookie, by The Globe’s own Shawna Richer, I’m predicting a new volume each fall until the one they call the Kid sees fit to retire. The Rookie is the sum of the parts of a year-long assignment that sent Richer from her home in Halifax to follow Crosby to Pittsburgh for his rookie season. There were, as they seem to say in the newspaper business, plenty of storylines. Was Crosby up to life in the big league? How would he fare playing with Mario Lemieux, who’d also invited the younger star to move in with his family? Would the Penguins, newly stacked with an accomplished supporting cast, carry home the Stanley Cup? Was hockey going to survive in Pittsburgh? And what about rhetorical questions? How many of them can you really get away with, all in a row? Richer’s series made for compelling reading at the time it appeared it in the paper. Gathered between hardcovers, it feels flattened out. That’s not to say there aren’t telling details — the boy millionaire still gets twenty bucks from his grandmother at Christmas, for instance. And you’re not going to find better coverage of Crosby’s popularity in Quebec, or his fledgling (and undeserved) reputation as a diver. But somehow, all together, this is a narrative in which most of those storylines fail to bloom into full stories. Part of the problem is that Crosby seems to be a good guy who’s adjusted pretty well to the pressures of hockey stardom. Richer writes of his “polite polish” and that, along with the media-machining hockey players get nowadays, makes him a slippery subject. The Rookie’s platitude quotient (The kid’s a phenom/’I’m pretty proud of him,’ his dad said. ‘We both are happy for him.’) isn’t especially high, but there are few unguarded moments. It’s not Richer’s failing, exactly, but it’s a failing. That’s part of the beauty of Peter Gzowski’s indelible The Game of Our Lives, a book Richer says inspired her: all of Gzowski’s moments with Gretzky and the boys were more or less unguarded. Brodeur: Beyond The Crease has already ruffled some shoulderpads with its no-nonsense assessment of the Kyoto Protocol and why the United States needs to invade North Korea now. Okay, actually, no, New Jersey’s goaltender isn’t quite that opinionated. Still, Martin Brodeur has a reputation as an affably straightforward fellow. He’s also very good at what he does, with Stanley Cups and Vezinas and Olympic gold medals to his name. He has a good chance of surpassing Patrick Roy as the — hockey-word warning — winningest goalie of all time. Here he enlists The Toronto Star’s forthright hockey columnist Damien Cox to the cause of saying his piece. Why now? That’s hard to say. Maybe because Cox asked? He had some extra time during the NHL’s long lockout? Or maybe just plain duty. “I think I’m probably more aware than most players,” Brodeur reports. There’s a long and not overly distinguished of tradition of players co-authoring books while they’re still playing in the league, from the dead boring (see Eric Lindros’ Fire On Ice) to my personal touchstone of boorish bad taste, Derek Sanderson’s I’ve Got To Be Me. Brodeur is another animal altogether: an entertaining and insightful read from a certifiable hockey achiever. There’s plenty here in the way of inside stuff. He drinks three cans of Sprite during a game. He gets depressed when other teams start their back-up goalies against him. He wades into the age-old debate regarding what constitutes a bad goal, and the other one, not quite so aged, concerning how it feels to wear a goatee under your mask. He shares some hockey mysteries: did Pat Quinn really not know Roberto Luongo’s name at the Turin Olympics? What about the Swedes throw a game on the way to the gold medal game? The book Globe and Mail columnist Stephen Brunt hoped to write was more of a Being Bobby Orr, but Boston’s legendary number four politely declined to cooperate — he’s apparently saving himself for his own book somewhere down the line. That’s why the book Brunt did write is called Searching For Bobby Orr. Who knows what kind of story he would have told with that other verb; with this one, he delivers an exceptional piece of work. Those of us who missed out watching Orr in his prime can’t help but feel we were cheated, and the precision of Brunt’s portrait of the player only makes the sting sharper. As Gzowski knew and Shawna Richer, too, there’s nothing easy about transcribing hockey genius from flashing action on the ice to words on the page. 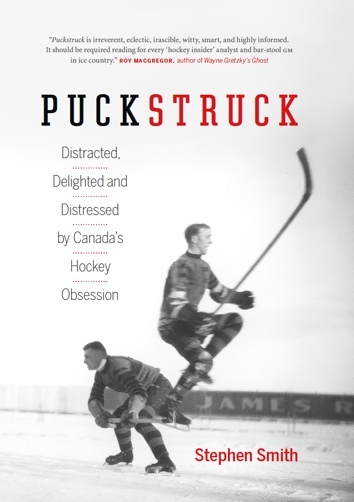 “He seemed to know things,” Brunt writes, “about his teammates, as hockey players, as people, that they didn’t necessarily know about themselves.” He’s just as good in erecting the larger framework of how post-war Canada changed in the 1960s and, with it, the staid old NHL. Orr’s is an appalling story, a big morbid Canadian tragedy somebody should put on the stage at Stratford. The golden boy, maybe the best ever at his game, up, up, up, where else to go but up? How about crashing down? Because even before the knees gave way, he was looking more and more like a man trapped by his own celebrity, impatient, angry, wanting nothing to do with any of the public trappings of stardom. He was 30 when he retired in 1978, limping and broke, too. Because of course the man who was guiding Orr’s rise just happened to be future felon Alan Eagleson. Searching For Bobby Orr doesn’t exactly redeem the old Eagle, but Brunt does manage the deft trick of showing him how he must have seemed in the mid-1960s — bright and energetic, a player, a guy worth having on your side. Brunt also overturns the popular fable that in 1975, when the Boston Bruins offered Orr a stake in the ownership of the team, the dastardly Eagleson never told his client. Orr may later have declared his ignorance, but maybe he just wasn’t paying attention. It was all over the papers at the time. Like Shawna Richer, novelist Bill Gaston took it into his head to follow an emerging young star around to see what makes him tick. Except that Gaston’s subject wasn’t, in fact, emerging or young or much of a star — it was himself. Midnight Hockey is a lovely book, which is to say bawdy, beautifully written, fresh, coarse, winsome, hilarious, smart, vulgar, joyful, and as rank with the realities of putrid hockey bags, diminishing motor-skills, and impending death as …. Well, let’s just say it’s a lot like the hockey most of us play, those of us who are willing and able past the age of 35. Sidney Crosby wouldn’t get most of it, but I think his dad would. A few chapter subheads might be in order to set the tone. As a younger man, Gaston, who’s now 52, was better than most of us who toil by night in dim light. He played a season of junior in British Columbia (you can look it up) and, more important, he has his own hockey card. In and around writing novels and short stories and teaching in New Brunswick and B.C., he also found the time and fortitude to play in France and China. Midnight Hockey combines a month-by-month chronicle of a recent year with his oldtimer team with assorted hockey memories (he once stood in Bobby Orr’s Parry Sound bedroom), tall tales, dressing room anthropology, ruminations from the far end of the bench. As it does, life also squirms in, which is to say, death. As the book opens, Gaston, who’s been blacking out, is in line for a brain scan — or what he calls “a head MRI.” All in all, it’s not for the meek, and it’s not to be missed. As it always does for hockey books, the depth chart goes on and on. I never have known quite what to make of memoirs by referees, and Ray Scapinello’s Between The Lines is no different. Thirty-three years he worked as a linesman in the NHL, retiring in 2004. He’s a genial guy, bit of a jokester, good at face-offs and breaking up fights. The whole project has the feel of a 272-page silver retirement watch. Screenwriter and hockey historian Michael McKinley is the man behind the coffee-table version of CBC-TV’s 10-part documentary Hockey: A People’s History. It’s a handsome package, the book, and nicely narrated. There’s a lot of ground he covers, starting with ball-and-stick games in ancient Greece and continuing on at a sprightly pace right up to Crosby’s Pittsburgh debut. It’s a tough assignment, telling a lot of the same old stories to those of us who know them well. McKinley not only does it with style but manages to find new angles and characters and scenes. He also widens his focus throughout to track the development of women’s hockey, which isn’t the usual thing. Andrew Podnieks is the Ryan Smyth of hockey chroniclers, or maybe I mean the Garry Unger. I guess what I’m trying to say is that he’s hard to slow down. He’s published more than 30 books since 1995, six in the year 2005 alone. His standard is high if (in a good way) esoteric — A Canadian Saturday Night: Hockey and the Culture of a Country is a charming example. But in a couple of cases he strays. His other 2006 book, Celebrating The Game, is one of these. Paul Bereswill, whose 136 photos Podnieks annotates, would seem to be a fine photographer but the evidence isn’t before the court here. Instead there’s a lot of background murk and dark reproduction — nothing near the etched quality of Podnieks’ previous forays in this line, Shooting Stars and Portraits of the Game. H.B. Fenn/Thomas Dunne Books, St. Martin’s Griffin, $12.95, 116 pp. McClelland & Stewart, $29.99, 318 pp. Knopf Canada, $34.95, 304 pp. Doubleday Canada, $29.95, 314 pp. McClelland & Stewart, $60, 346 pp. Fenn/Hockey Hall of Fame, $50, 138 pp. GreyStone Books, $26.95, 136 pp. “It’s no pink tea, and mollycoddles had better stay out.” Ty Cobb said that about baseball, but I think he really meant hockey. It was ever thus, of course: here on my desk I have Ira Gitler’s 1974 book, the inexplicable Blood on the Ice: Hockey’s Most Violent Moments. There’s an early chapter called “Woodchopping Galore” and another, later on, “Techniques of Mayhem”. So why does today’s NHL just seem so much more dangerous than it used to? Maybe it’s Marty McSorley, the man who helped the words conditional discharge into hockey’s lexicon. Could be the terrible injuries that recently ended the careers of Trent McCleary, Bryan Berard, and maybe Eric Lindros. I think it’s the injuries. I mean, do you read the casualty lists The Globe publishes week by week throughout the season? It’s all there: Brad Werenka’s fractured orbital, Saku Koivu’s back spasms, the pulled groin, chest contusion, and torn ACL afflicting Dominik Hasek, Brian Skrudland, and Rem Murray, respectively. By mid-season, the wounded are strewn across the page in their dozens. Pour me a cup of pink tea, but I can’t help thinking that all this pain can’t be good. Take a tour through the seasonal slate of hockey books and you may find that while the poetry of the game — its speed, athleticism, character, and event — is all there, what lingers is all the pain the game generates. This year, somehow, the pile of hockey books in my office just seems to be the source of a stubborn atmospheric ache. It’s hard to say just how much of it originates with former Maple Leafs defenceman Bobby Baun; let’s just say a lot. Written with an assist from journalist Anne Logan, his autobiography is called Lowering The Boom (Stoddart, $26.95), though Coming Through Slaughter would have served. In his book Tropic of Hockey, Dave Bidini elects Baun, who broke his big toes thirty or forty times during his career, “the most-mangled player in the history of hockey.” I’m with him. In 1961, in a game against the New York Rangers, Baun caught Camille Henry’s skate in the neck, which it penetrated, poking through to touch the underside of his tongue. A conscientious doctor cleaned the wound and stitched it up, and Baun played another two periods. After the game, it’s true, he almost died, but he was back playing a week later. That meant he was around on April 23, 1964 to play, famously, in the Stanley Cup Finals against Detroit, break his leg, and score the game-winning goal in overtime. The hockey memoir is, most often, a rueful vessel, foundering under the weight of lost camaraderie and elapsed glory. Baun seems like a genial fellow, but once he admits that that wounded goal is the peak around which the rest of his life is spread, well, Lowering The Boom just starts to get you down. The tone throughout is hale and jocular (“I never dared look at Henri [Richard] and call him a ‘frog’; instead, I used to call him ‘gorf’ — frog spelled backwards. In some games, Richard would claim he’d been hit so often he thought he was in a war!”), and you’d think that would help, but it doesn’t. Lowering The Boom is jocular, unreflective, and standardly lacking in telling detail, and in that it’s no worse than any other hockey autobiography. It just doesn’t feel like it contains a life. Techniques of Mayhem would actually be a serviceable title for Keenan (Stoddart, $?? ), Jeff Gordon’s incisive biography of the fearsome former coach of Philadelphia, Chicago, New York, St. Louis, and Vancouver. Few current NHL coaches can match Keenan’s successes, which include a Stanley Cup with the Rangers, but then not many have embittered as many people as the man whose nicknames have included Iron Mike, Darth Vader, and Hitler. Gordon shows him in full livid colour, presiding over “death-skate” practices (“two-hour skate-puke-skate marathons”), and screaming at the players he doesn’t believe have what it takes. (Dominik Hasek, Curtis Joseph, Brendan Shanahan, Tony Amonte, Brett Hull: you could stock a pretty good team with the players Keenan has scorned over the years.) Well researched and fluent in the writing, Keenan reveals a complex character who describes himself as a “striver” who runs on fear more than anger. Michael McKinley’s new book, Putting A Roof On Winter: Hockey’s Rise from Sport to Spectacle (GreyStone, $34.95), sounds a little like a sociology thesis, but it’s actually a lively history of the professional game’s first 100 years. McKinley has a good eye for detail and casts it on some wonderful (if not altogether undiscovered) characters. The wholly underwhelming Chronicles of Hockey: An Insider History of National Hockey League Teams (Key Porter) features an all-star line-up of writers ( Eric Duhatschek, Trent Frayne, and Al Strachan among them), but it’s hollow once you get inside. Is it just me or does the presence of the word insider on the cover suggest that the book beyond is standing by with fresh news and revelation, gossip, secret codes, possibly even a skeleton or two? Full of indifferent team histories and lacklustre player profiles, Chronicles of Hockey is as steadfastly ordinary as the modern-day Montreal Canadiens. The NHL All-Star Game: Fifty Years of the Great Tradition (HarperCollins, $39.95) is a much more illuminating book, but then that’s no surprise, since it’s by the prolific, painstaking Andrew Podnieks. Serious students of the game know already to follow where Podnieks leads. Set him down to study a scoring summary or an old photo and Podnieks is — well, I’m thinking his attention to and reverence for the game of hockey compares with Nabokov and his bond with butterflies. The NHL All-Star Game has the line-ups and summaries, but the really good stuff is in Podnieks’s essays. Did you know that in 1953, the NHL presented its All-Stars with “shoes, lighters, blazers, stickpins, sweater coats, hats, and fishing rods”? Or that, before the 1982 game in Washington, D.C., at a White House reception, Ronald Reagan fed Blaine Stoughton and Harold Snepsts crab bisque and cheese straws? Now you do. Former broadcaster Brian McFarlane weighs in with two books this fall. The Blackhawks (Stoddart, $27.95) is the final installment in his series about Original Six teams. Like the others that came before, this one is a compendium of page-long anecdotes covering the history of the franchise. It’s often amusing, but also exasperating: whenever McFarlane comes to criticize, he passes off to another writer, reprinting columns by Eric Duhatschek and Al Strachan, for instance, to bash long-time Hawks general manager Bob Pulford instead of taking a stand himself. Brian McFarlane’s World of Hockey (Stoddart, $22.95), a memoir, is more interesting. Whether he’s remembering his father, Leslie, the writer (he may be best known now as a writer of many of the Hardy Boys books), settling scores (with Stan Fischler and Harold Ballard, notably), or leading the way behind the scenes at Hockey Night in Canada, McFarlane makes an agreeable host. That said, for some reason he decides to end the book with transcripts of after-dinner speeches on which he and colleagues like Dennis Hull and Jim McKenny travel the rubber-chicken circuit. Mike Keenan’s death-skate was never so cruel. Maybe because I wanted to go out on a pain-free note, I’ve left the season’s best books to last. In Ice Time: A Canadian Hockey Journey(Viking/Penguin, $33), Hockey Night in Canada host Scott Russell goes after the soul of the game away from the rush and glare of the NHL. He remembers his childhood hero, the Leafs’s Ron Ellis, and, later, steps through the looking-glass to get to know him. He travels the Prairies with Edmonton Oilers’s scout Lorne Davis. He gives us the wonderful story of a sublimely skilled Newfoundlander, Andy Sullivan, who could have had it all in the NHL, but decided he didn’t want it. <Italics>Ice Time<italics> is all the things the professional game mostly isn’t nowadays: simple, affecting, and true. As far as I’m concerned, Dave Bidini’s Tropic of Hockey (McClelland and Stewart, $??) belongs on the shelf of necessary hockey books, up there with Jack Ludwig’s Hockey Night in Moscow, Ken Dryden’s The Game, George Plimpton’s Open Ice and everything by Roy MacGregor. The seed for this fresh, frank, and piercingly funny book was planted in 1986 in a last-ditch motel in way-out Georgia, when Bidini (who’s from Toronto, and also plays guitar for The Rheostatics) happened upon an old goalie from Oshawa. If you believe in hockey, Bidini decided that day, it will find you. A decade later, disillusioned with the state of the Canadian game, he took his belief on the road, to see how the game is faring far from its home. What’s hockey like away from “economics, corporate lust, the ravages of progress?” Off he went, with his wife, Janet, and the sticks and the big, rank bag of equipment that is our birthright as Canadians. When Bidini told the soldier at the airport in Dubai he was there to play ice hockey, the guy waved his gun and said, “You are crazy.” But Bidini played, there and in China and in Transylvania. The ice was good and it was bad, the hockey, too. It didn’t matter which: wherever Bidini goes, whatever the conditions, Tropic of Hockey is a manic, bawdy, marvellous piece of work. Journeys, of course, are as much about starting points as destinations, and Bidini finds plenty of room to ruminate about the game back home, its lore and history, his own complicated love for it. Going abroad, he hoped, he says, to find the game in its simplest, purest form, hockey as it used to be, a game of passion and of people. Guess what? He found it, and it didn’t hurt a bit. Not that much, anyway.